Baggage handlers and check-in staff employed by GH London Ground Handling Services at Luton Airport have voted for strike action. The decision was taken in response to the company’s decision to impose a pay freeze on staff. Wizz Air has revealed the launch of a new route between Gatwick Airport and Cluj-Napoca. The news follows an announcement from Wizz Air UK, a UK-based, wholly-owned subsidiary of Wizz Air Holdings, that it plans to expand at its London Luton base. Wizz Air has welcomed the opening of its new, 3,800-square metre state-of-the-art training centre in Budapest, Hungary. As part of a ten-year agreement, CAE is also providing training centre operation services to Wizz Air by operating and maintaining the training equipment suite for the airline at the new facility. The new Gatwick connection to Hungary’s capital will see Wizz Air increase its presence at London’s second busiest airport, where it already operates flights three times daily to the Romanian capital of Bucharest. The new service will operate on Tuesdays, Thursdays and Saturdays and connects UK passengers to one of Ukraine’s major cultural and scientific hubs. Wizz Air has become the latest carrier to be hit by the rising price of fuel, downgrading its forecast for full-year profits. The European carrier also pointed to a summer marred by air traffic control strikes and congested airports for the cut. Wizz Air has celebrated the first flights on six new routes from three UK airports and the first flights under Wizz Air UK’s own W9 IATA code. 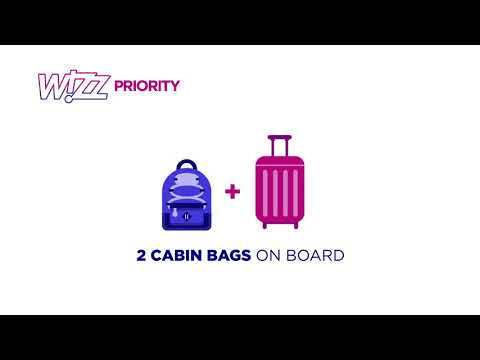 Wizz Air has announced its new baggage policy which guarantees all passengers to bring one free carry-on bag into the aircraft cabin on all flights from November 1st. Wizz Air has appointed Joel Goldberg to the newly-created position of chief digital officer. Goldberg, currently senior director technology, Europe for Nike, will take up his position on October 1st.